While I admit I have not been paying much attention to the weather (or this blog for that matter) it came as some surprise to wake up to an inch os snow this morning. Wonder how much more we are going to get? Shaking off the cobwebs from a great family party. Smelling the coffee brewing. Helping a friend with a year-end move. Heading back to Delco for more family time. Gosh, working in higher ed has some benefits! While I would like to say that Philadelphia looks beautiful under a blanket of white, I must acknowledge to truth of the situation. Philadelphia looks paralyzed today, grey ribbons of icy slush hemmed in by truck-sized piles of snow, the growl of snow blowers and the curses of pedestrians everywhere in the air. 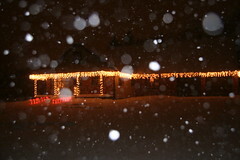 Well I braved the 16 inches of snow we have here in Mount Laurel to get you this shot of our Christmas lights in the Blizzard of 2009. The roads are barely plowed and our driveway and walk are unshoveled. What's the point when you are getting an inch of snow an hour? The kids enjoyed the day and are looking forward to even more fun in the snow tomorrow. The snow is superfine and dry. It's like shoveling baking soda. We decided to get out for the last time before we get snowed in so we are headed to see Santa! John's class is putting on its holiday pageant tonight and he just had his big moment with the sleigh bells. Ahh fatherhood! Another Delco Guy and fam are roaming the streets of Philadelphia and have happened into the Center City Macy's at the Wannamaker Building. Bring on the show! No. That pile of beer bottles in the lower left is not trash. If you guessed it is a sculpture, you would be correct! One of the holiday traditions in Student Financial Services is decorating for the holidays. This year we have added a fireplace to the office and Elf Stephanie is hard at work hanging our stockings! Today is Char's birthday and I just wanted to say how happy I am to have her in my life. She's doing a great job as a new mom and helping to manage a new house. Char is my sidekick out on the town, my friend when we are at home, my partner when we are doing all the tough things. So happy birthday to the most important woman in my life. I love you sweetheart! Have a happy birthday! Quick review: expensive, below average food, drinks that reek of cheap mixer and indifferent service. Verdict - McDonald's at WalMart is better. We are here in Swartmore with the family and some friends for the annual Newsome holiday gathering. Hats, glove,s boots, snow pants, long underwear, we got it all! All I can say is huh?!? US Airways 3648 is delayed, so I have taken refuge from the frigid Nashville temperatures at Blackstone Restaurant and Brewery. Hopefully I get home tonight! Pretty town. Hope the food and music are good! Everything about the Gaylord Opryland is BIG and the Christmas lights are no exception. At least I got a suite! This is a BIG conference! The kids and GF are kissed, I am packed and headed to PHL.